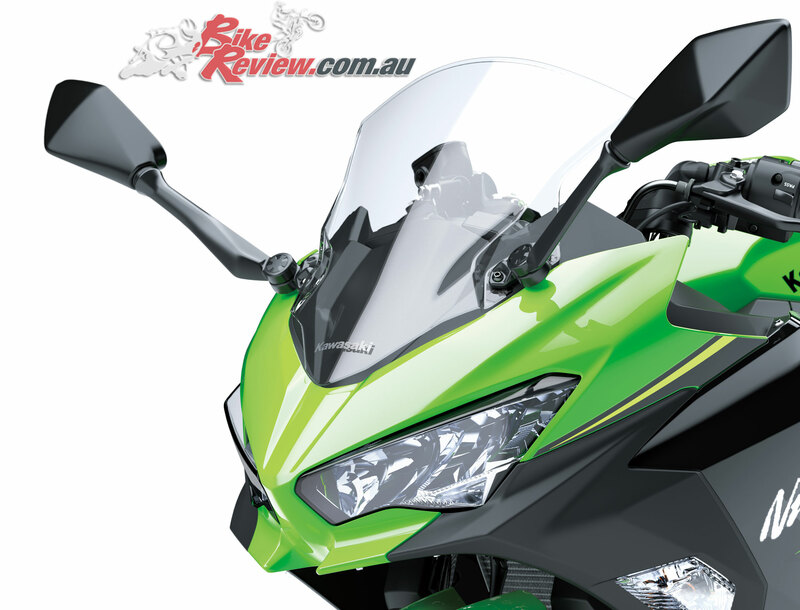 The Ninja 400 is all-new and possesses many advancements over its highly successful Ninja 300 predecessor. To do this, the design team, headed by Kunihiro Tanaka (Kuni-san), envisioned and dedicated themselves to developing a motorcycle that was not only very learner friendly, but a machine that offers fun and interest by way of performance, character and rideability. 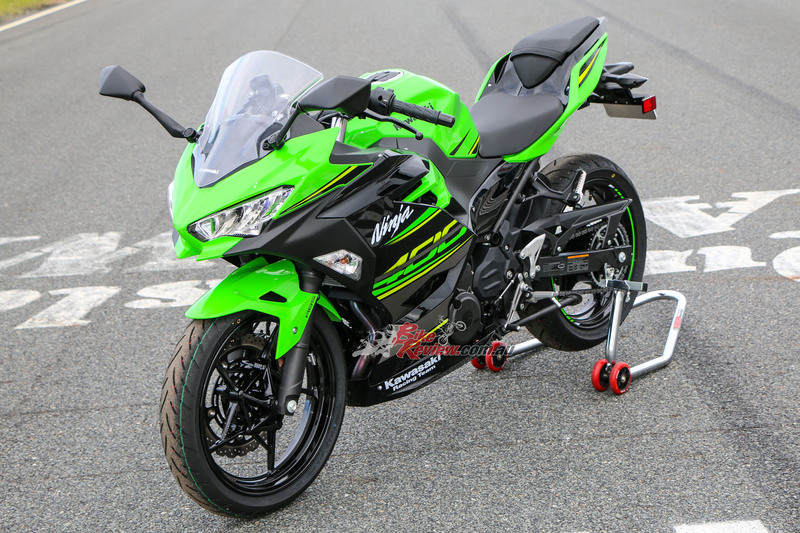 The Ninja 400 comes in at a $7699 Ride Away for the green or a few hundred less for black or orange. Kawasaki brought Jonny Rea (not a typo! ), Kuni-san, development rider Kenichi Tojo (Tojo-san), and KMA managing director Kenichi Hashiba (Keni-san) to the launch to help share their excitement about the model. Make no mistake, the bike is designed to stand on its own merits, well beyond being a “LAMS bike” that you may want to own for the shortest time possible. Without going into detail here (see technical breakout), Kuni-san and his team focused on building a bike that was going to dominate its competition. The key to this aim is a simple design ethos that essentially is the more comfortable a motorcycle is to ride, the easier it is to ride fast and to enjoy. 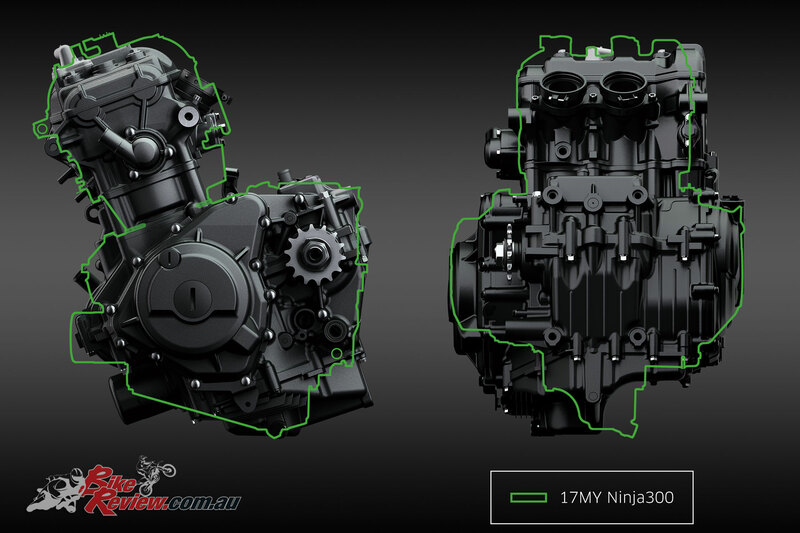 As a result, in comparison to its predecessor, the Ninja 400 has a new engine delivering substantially more power and torque over the entire operating range; is 6kg lighter, features a minimal but highly effective trellis frame/long swingarm design, and includes inspiring riding aids such as an ultra-light slipper clutch and ABS. It is also a smart and nicely finished motorcycle. Lightweight and ease of riding were the motivating factors for Kawasaki design engineers working on the 400. I had not been to Lakeside before, but the 2.4km circuit turned out to be a fabulous playground for the little Ninja. 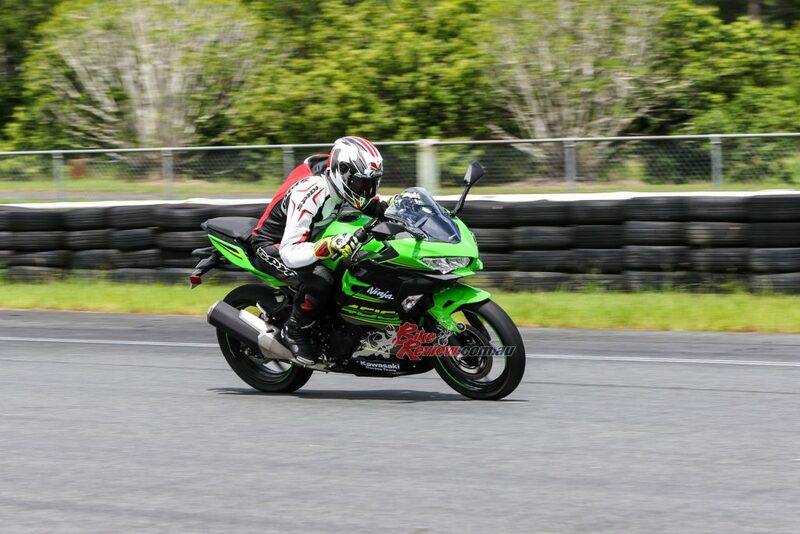 Funnily, the track surface is in some ways so lacking that it made the Ninja shine even more. We had damp, fully wet, and dry conditions all in six hours and in that order. 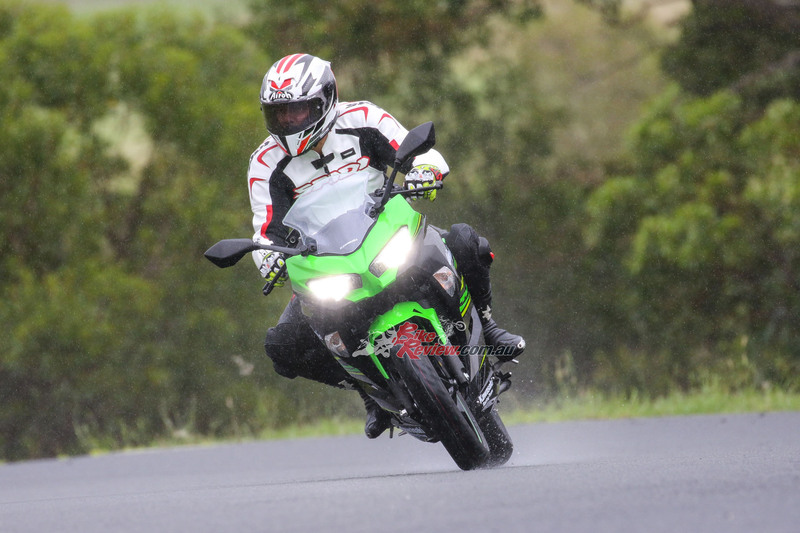 The eclectic mix of weather ended up providing perhaps a better overview of the bike’s behaviour in favourable and unfavourable conditions. Tojo-san, whom had completed tons of laps over the previous few days, did us the honour of leading us out on our sighting laps before letting us loose. We rode in two groups in 15-minute sessions, with four bikes on track at a time. The bikes were provided as out of the box, except for careful preparation and tyre warmers on the stock rubber. 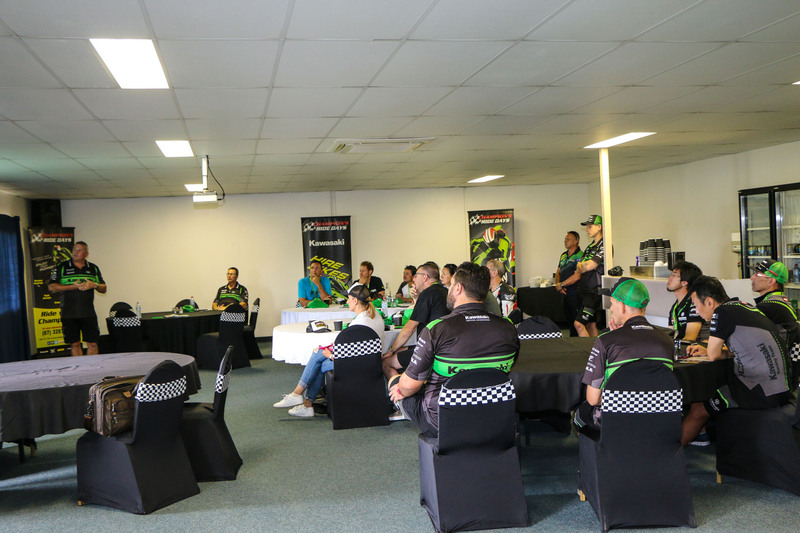 All bikes were presented to the press standard for the morning, then got race rubber and more rear preload for the arvo sessions, which were held on a dry track. Session 1 was interesting. Rain, new bike, new leathers, untried track, cracks and ripples, standing water, mud, and off-camber just about everywhere. What better time for it? Hop on, feet on ground easy and a clutch so light that Rob from Kawasaki warned us to be careful not to activate purely by accident. The bike in its entirety felt immediately comfortable in position and feel. Click into gear, feather out the feather-light clutch and ride off into the rain. Rain, new Sidi leathers, new Five gloves, new Xpd boots to wear in, on an unfamiliar track that is known for a bad surface. Simon was chuffed the Ninja 400 made it so easy for him, in fact, he enjoyed the first session, somebody get that man a straight jacket! He is bonkers. The drivetrain is smooth and tractable, providing an instant feeling of widespread torque, making it possible to ride the whole track in taller gears without shunting or complaint. 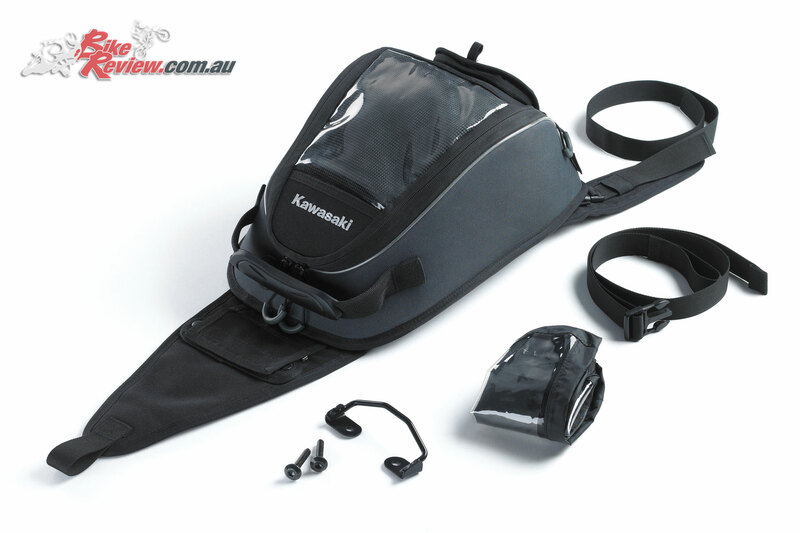 This revealed a forgiving nature that will assist new riders hugely. After half a dozen laps and feeling OK with the conditions and where to avoid standing water, it was time to start turning up the wick a little. Entering the straight at a sedate pace in fourth, I ploughed open the short travel throttle, changing up around 10,500rpm to find that meeting T1 at around 160 was initially enough. Next lap a wee bit more until about 175 when my line was starting to shift inexorably towards areas you don’t want to be in the wet. From T1 is a short stretch before you must haul up quickly for the beginning of a triple apex T2. Braking in the wet is excellent, really, with little lever pressure required and minimal dive to affect the front suspension travel. During the day, if I did trigger the ABS anywhere I never felt it. Feel for front grip on the brakes was so good that I could be ham-fisted and never have an issue turning in either early, late or on time. This is where the slipper clutch and gearbox shone too – the slipper was simply fantastic in coping with my reckless boot, with the bike never hinting of anything out of the ordinary. The clutch operation was so seamless that you basically took it for granted. This motorcycle really works in concert with its rider. Lakeside used to have the fastest average speed in Australia before the Bus Stop was added. 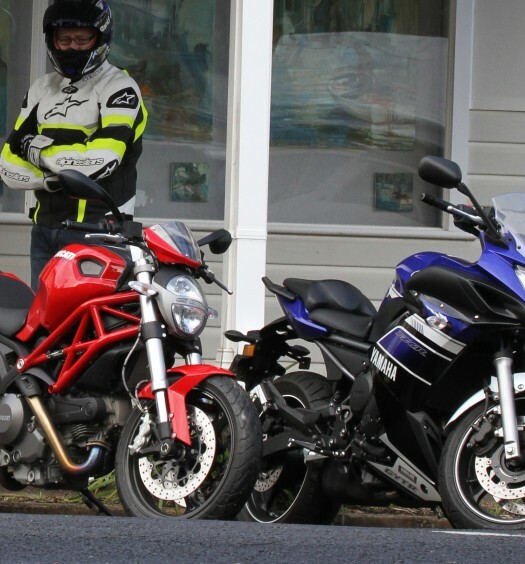 It was a perfect place to test the Ninja 400 and Simon found the bike extremely easy to ride. Perhaps even despite its rider. The first two bits of T2 were good in that I went where I wanted, but I could not garner confidence enough to hold tight on the tightening radius uphill section to T3. I had one good go and at this moment both tyres lost traction momentarily – my reaction was to let-off and hope. 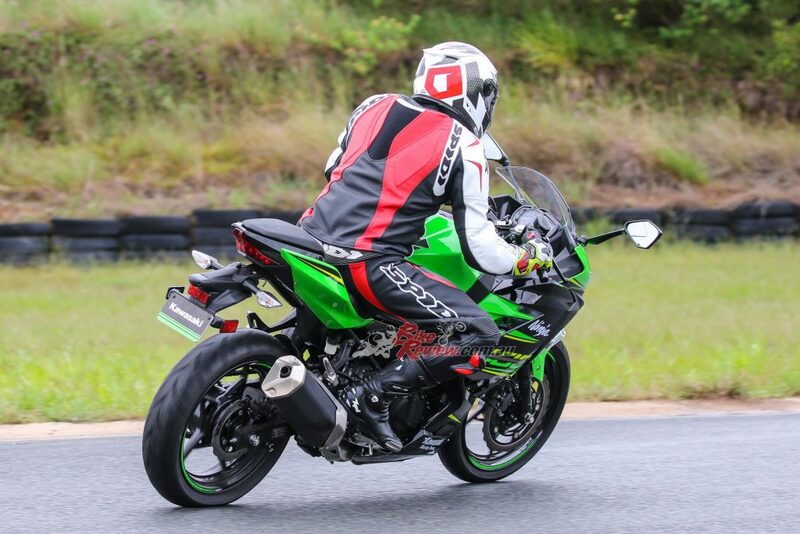 I needn’t over-react – the Ninja helped me again by informing me it was losing grip on the bitumen but in a way that did not cause extreme panic. When I released the throttle, it did not stand up or even feel like it wanted to – traction returned virtually immediately, still on line and I went on my way. This also occurred with the font tyre off the first apex of T7. Geometry is learner friendly and it is no KR1S250 but the Ninja 400 is still a Boy or Girl Racer’s dream to ride on track. After lunch, it was basically a dry track. A talking point was top speed on the straight. I saw 186 and Gareth Jones 189, which is pretty damn fly given the circumstances. Even in the dry and feeling quite confident I still could not “do” T2 the way I imagined. Other sections, like the crazy “Bus-Stop” was improving a lot and it was easy to start confidently diving into the corners. The engine never missed a pulse all day and you could hang on to a gear extra-long if you wanted – there was good motor headroom and a linearity to the power delivery that provided options for gear position into, through and out of corners. This is fantastic as it does away with negative effects of getting bogged down or banging a hard rev limiter by accident when you really don’t want it, and again demonstrates the flexibility of the powertrain. The pit crew changed the setup of some bikes with stickier rubber than the already good tyres and increased the rear spring preload. Until then I was simply happy how things were, however, swapping to a modified machine instantly improved cornering noticeably, especially mid-corner. I could finally get around T2 with some efficiency. Not only that, but the corners where I previously had moments were now beckoning in a very different way and it was sheer joy to push harder in them than ever before. 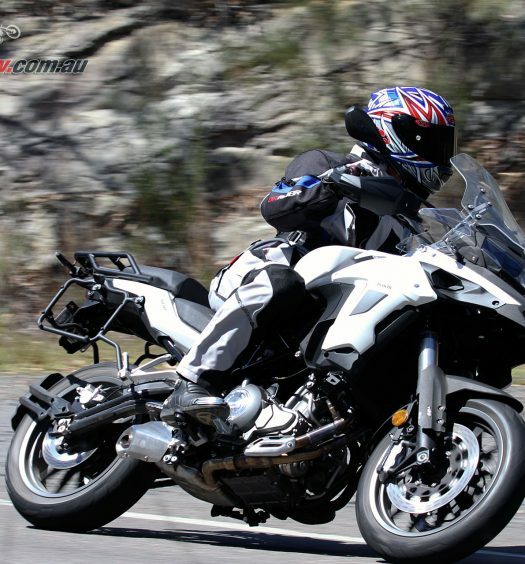 Direction changes are super-easy, with the bike eager to flip side-to-side with very little physical effort. In fact, I had to force myself to ease up with my unnecessary arm pressure and allow the bike to flow, which felt so much more relaxed and probably faster too. The manner in which it stayed true to line was inspiring, even if you needed a bit of extra front brake in, or a gear change during a corner. Its ability to cope with not the smoothest or most predetermined riding was quite brilliant. We probably did 70-something laps, and I finished the day smiling foolishly and not feeling sore or worn out at all. Plenty of room for big or small riders and a neutral position for riding in situations like this makes the 400 a very unintimidating, compliant learner bike that will still allow some sporty fun. 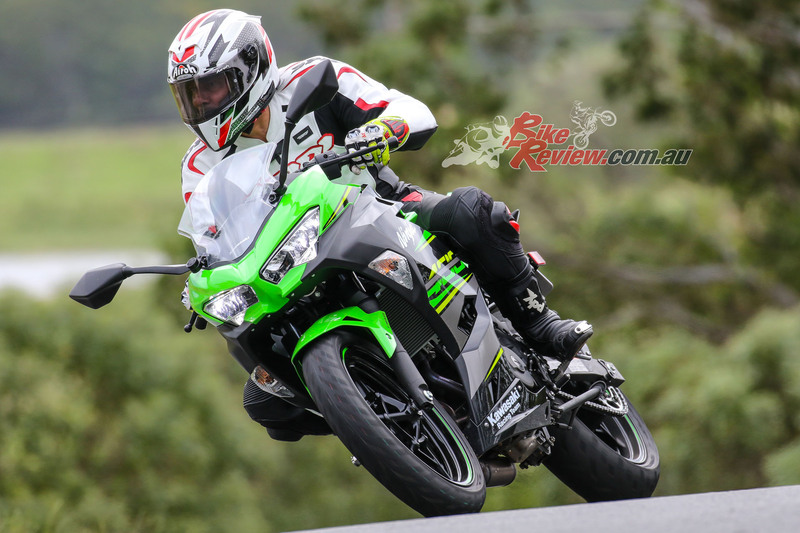 In summary, the Ninja 400 is a light, comfortable and super-easy bike to ride that provides a sublime mix of reassuring and easy-going manners. 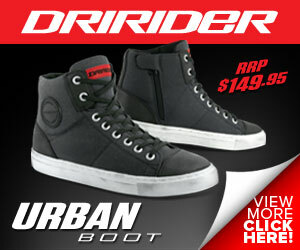 It also packs legitimate sportsbike response and handling that will satisfy a lot of riders, both new and experienced. 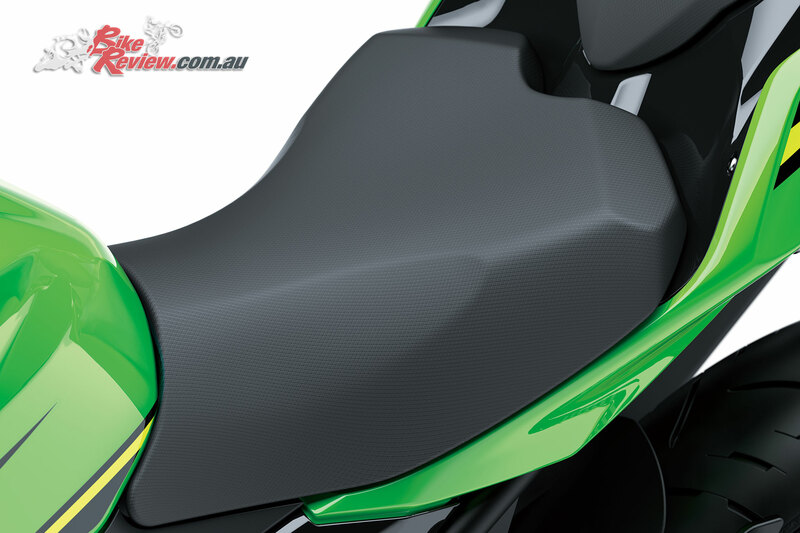 The characteristics that the design team have built into the bike will be hard to top. 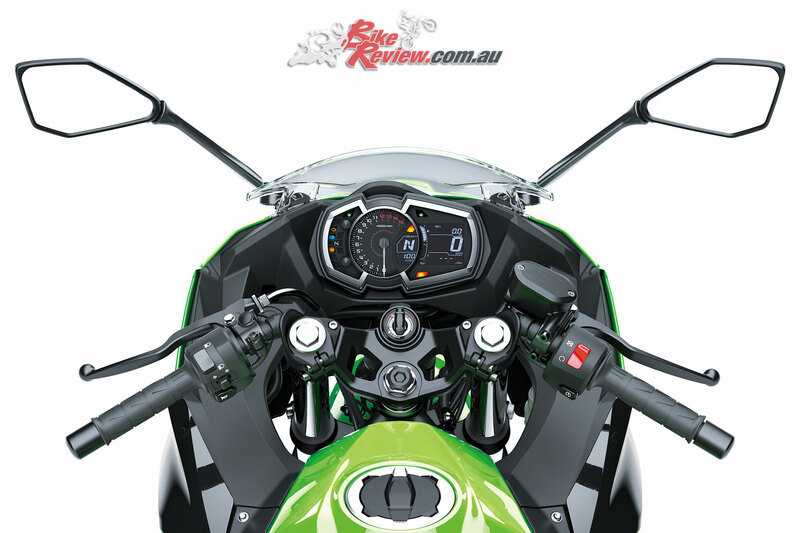 Kawasaki have done a great job on the Ninja 400 and held it to a price-point that is real value for money. 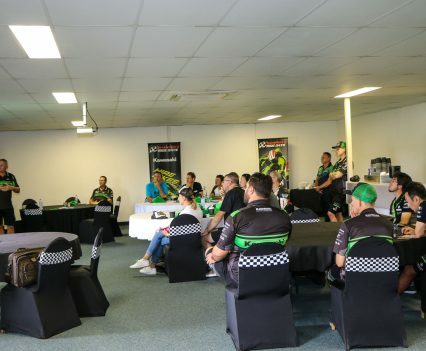 Thanks to Kawasaki Australia for inviting bikereview.com.au to the launch of the 2018 Ninja 400 at Lakeside Park, Queensland. Team Green provided a fantastic experience that was exciting, informative, and had a few surprises in the wings. Kawasaki Motors Australia with (L to R) Test Rider Ken Tojo, Project Leader Kunihiro Tanaka, KMA MD Kenichi Hashiba. 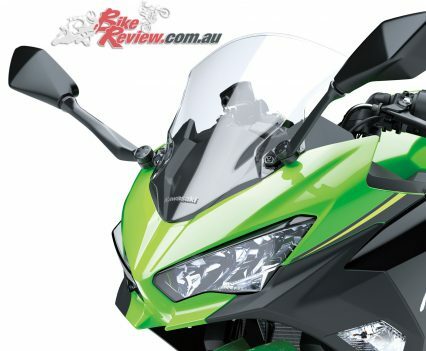 The Ninja 400 features many improvements over past models in all aspects of its design, which clearly demonstrates the serious and determined approach that has been applied to make it flexible, forgiving, but highly responsive and fast. As you go through this summary list of features, remember that weight saving and enhancements to ease of riding have been primary motivators. New design 70.0 x 51.8 bore/stroke 399cc parallel twin, four-valve engine (about 35% larger than the previous engine) yielding a 15% peak power increase and greater power/torque at all rpm, for more linear power delivery. Valves are 27.5mm (I) and 23.5mm (E) and the camshafts are forged, saving 200g. 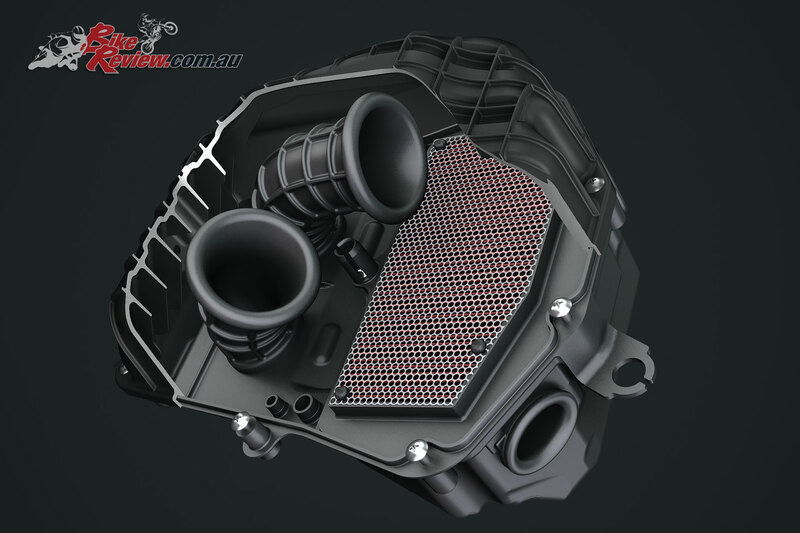 Pistons feature flatter crowns and reduced squish for an 11.5:1 compression ratio. The lightweight pistons run in plated bores (no sleeves, like the supersport and superbike model variants) in the die-cast aluminium open-deck cylinder and are oil sprayed from beneath to assist cooling. The flywheel is lightweight for crisp response and general mass reduction. A lower mass crankshaft with improved webs is enhanced by a fully machined balance shaft for superior running smoothness. The larger 5.8l airbox houses a twin downdraft intake to 32mm oval throttle butterflies that rest slightly off horizontal for better initial throttle response. The downdraft system straightens air-flow and reduces turbulence for improved efficiency, with the intake trumpets different lengths to prevent harmonic or pulse effect from occurring. Single, fine-atomising injectors are positioned to spray directly into the combustions chambers. The spark-plugs are “long reach” to increase heat transfer to the engine, and use low interference coils. Overall dimensions are minimised, keeping the engine no larger than the 300 and even keeping the amount of oil required down. The cylinder is canted forward 20°, with cam-chain mounted to the side and primary drive centralised (traditional positions swapped) to reduce engine height and width, and slimming the rear of the crankcase. The cooling system design has a reduced number of parts, with thermostat and pump positioned to minimise the number and length of cooling pipes, and the amount of water required. 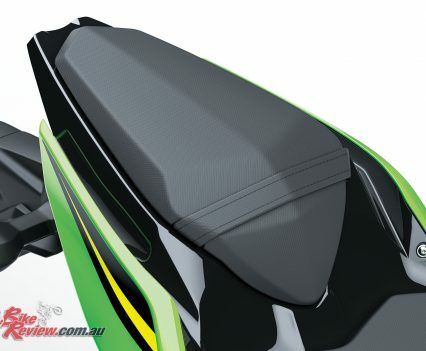 The radiator fan cover is a patent-pending single-piece design that efficiently directs hot air away from the engine and rider to improve cooling efficiency and comfort. The exhaust system is straighter in design and uses 0.8mm tube for, again, weight savings. The six-speed gearbox features closer ratios that match engine characteristics and assist in keeping acceleration constant. 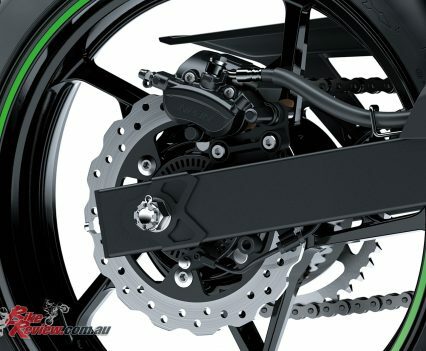 The transmission is paired to the engine via a new dual action slipper clutch that features not only standard slipper action but additional ramps that assist positive engagement between the clutch plates on drive-torque. This results in less clutch spring preload required, reducing lever effort by 20% and making for single-finger operation and minimum fatigue. Clutch plate diameter has been reduced 10% from 139 to 125mm diameter. The high-tensile tubular steel trellis frame is similar in concept to the H2 and utilises Kawasaki’s dynamic rigidity analysis. The engine is a fully stressed member, reducing frame materials and providing scope for a steep 24.7° rake, 1370mm wheelbase and lengthy swingarm, culminating in speedy direction changes and stable feel. The frame tubes connect to the cylinde- head, then extends rearward, rejoining the engine at the rear of the crankcase. 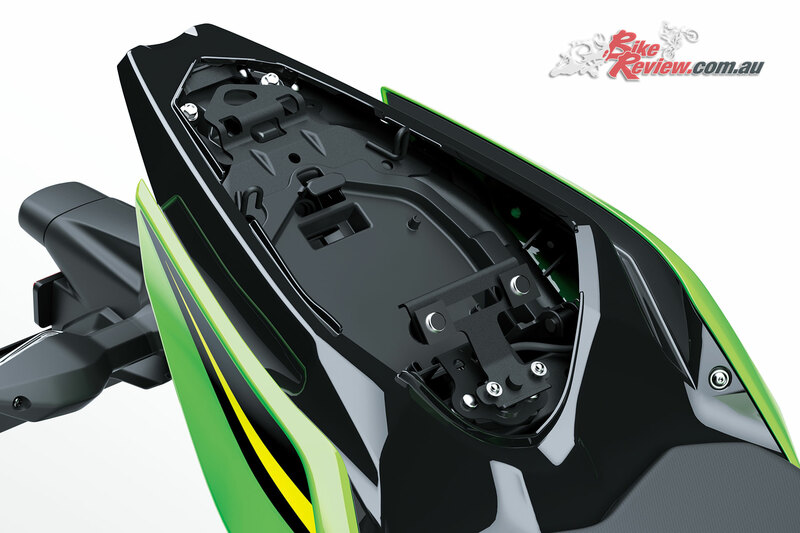 The box-section swingarm and rear suspension attaches to a H2 inspired die-cast aluminium mounting plate that fixes directly to the rear of the engine, eliminating additional frame components for supporting the swingarm. The conventional forks are stiffer 41mm (previously 37mm) units that do not provide adjustment, however, eliminate needing a fork brace. 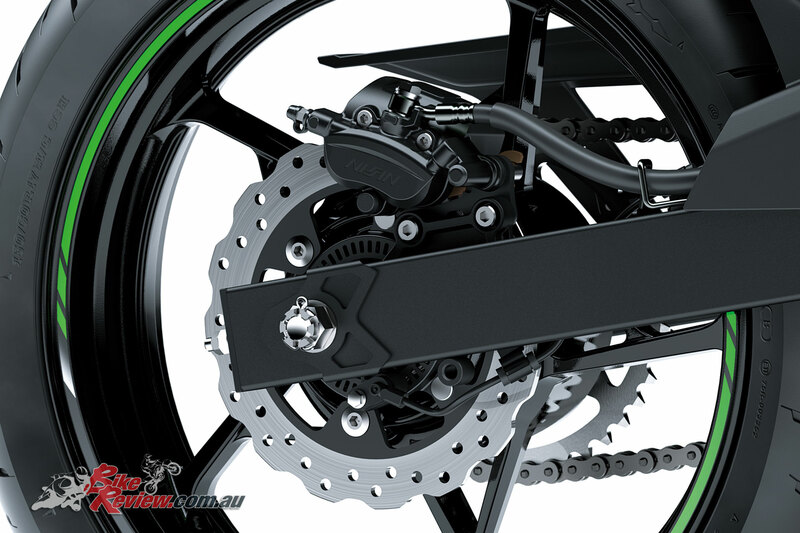 Rear suspension is a single spring-damper unit with 5 spring preload settings and revised linkage for a more supple action. 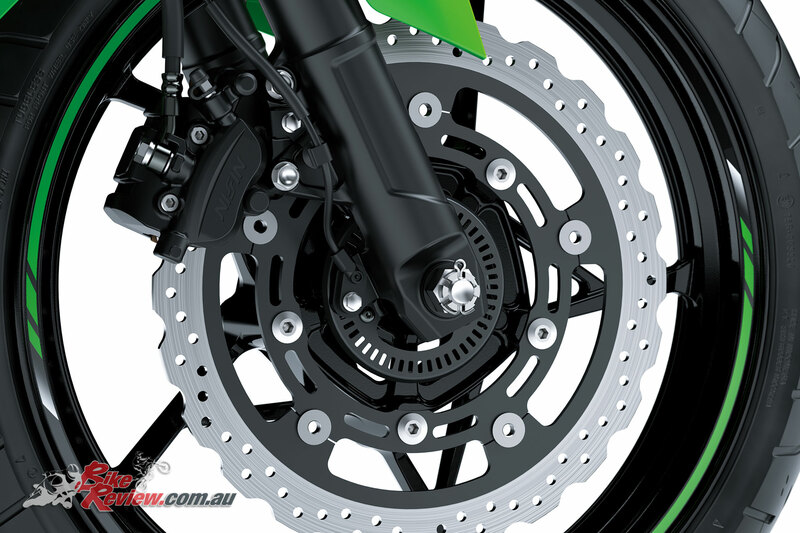 The front brake features a class leading 310mm semi-floating disc and twin-piston caliper. The new master-cylinder reduces idle stroke so less travel is used to re-compress the fluid, and coupled with matched hose dimensions and materials, provides better feel and control. ABS is now standard, controlled by a Nissin module that is currently the most compact and lightest available. 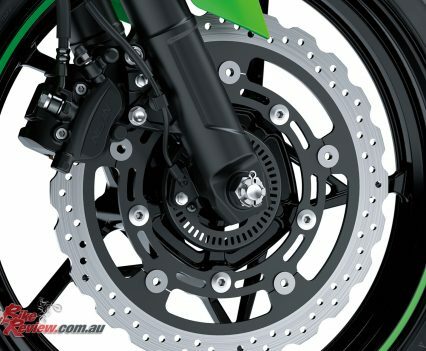 Rear brake is a 220mm disc and twin-piston caliper with larger 27mm pistons. Wheels are race-inspired 5-star-spoke patterns items that feature optimised lateral rigidity and light weight to assist ease of handling and corner stability. Tyres are now radial type, with the rear a 150mm section for more road contact and improved appearance. 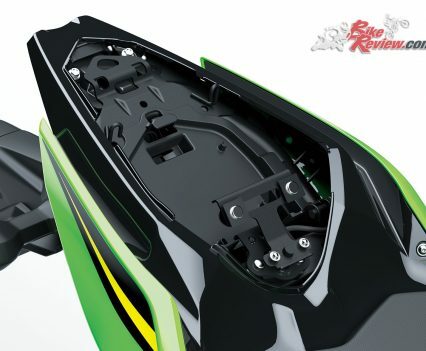 The ergonomic triangle between seat, handlebars (mounted above the top clamp) and footpegs is refined for best comfort for most rider sizes, but provides room to move and spirited riding. Seat height is a friendly 785mm (three seat options available) and provides 90mm of cushioning depth. Svelte, H2-style bodywork sheaths most of the bike, pulls air from the engine area and also directs air around the rider. 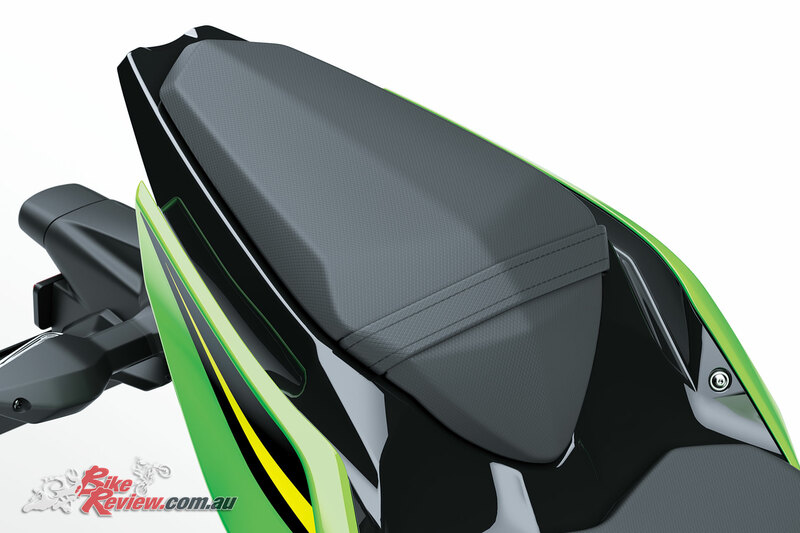 The 14 litre fuel tank is narrow at the back and corresponds to the 30mm slimmer frontal area of the seat to improve leg reach and assist easy manoeuvring on the move and in traffic situations. 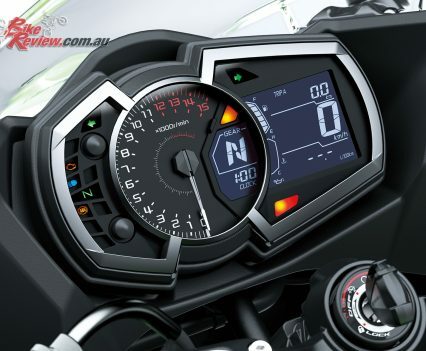 The instruments cluster is classy and includes analogue tachometer (thank God! 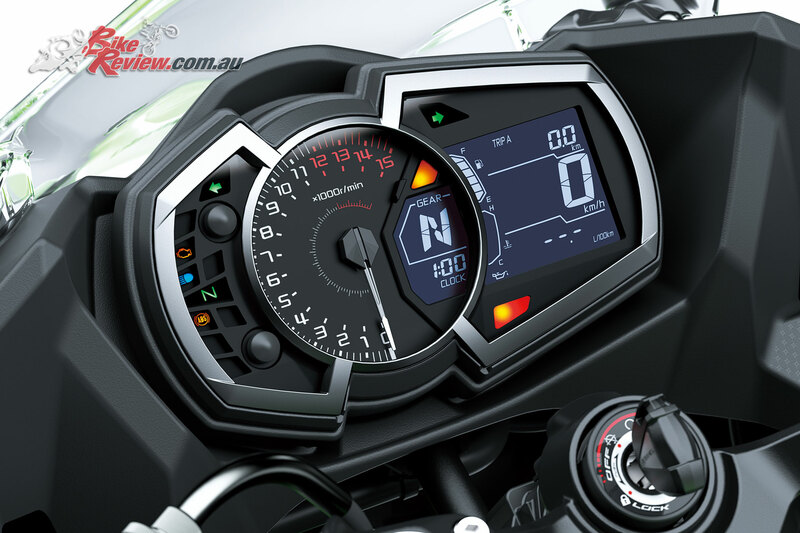 ), with normal warnings lights, plus LCD speedometer with additional functions (examples, trip meters, economy, remaining range etc) and gear position indicator. 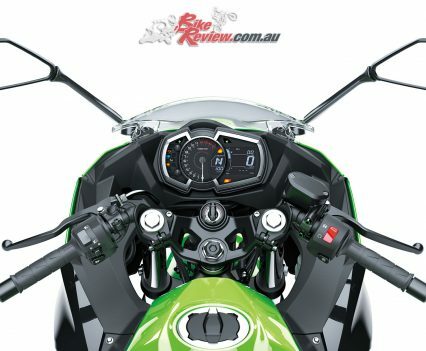 Many important detail ancillaries and touches abound, such as under-seat storage, full LED headlights, luggage hooks, flush-mount indicators, anodised fork caps, aluminium footpegs and general machined finishes that in combination present and sustain a high quality, well-built and stylish motorcycle. 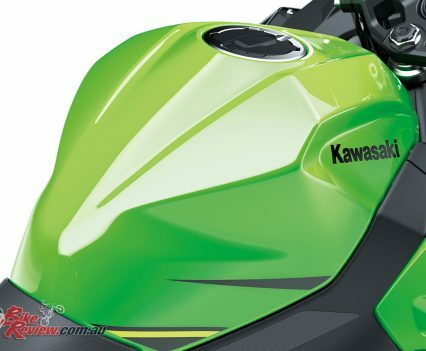 Kawasaki also offers a range of additions, such as pillions seat cowl and crash sliders. 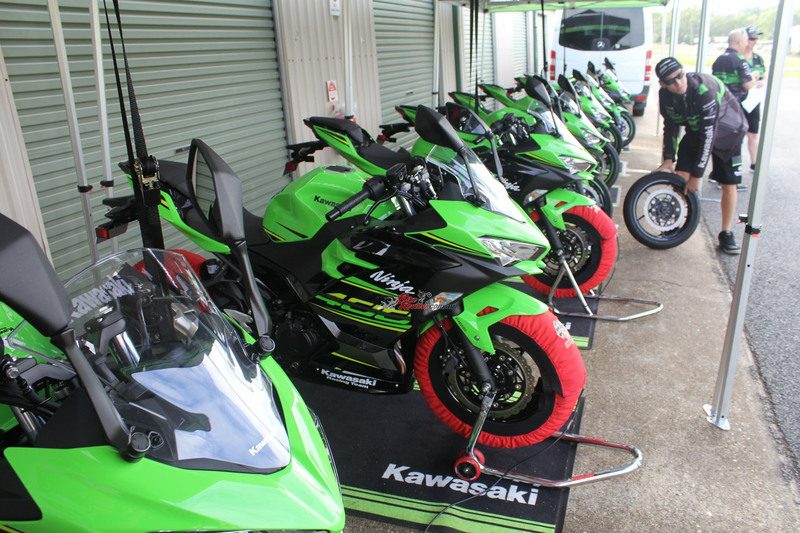 The Kawasaki team provided a wonderful launch experience and two great surprises for the launch day (apart from how good the bike is). 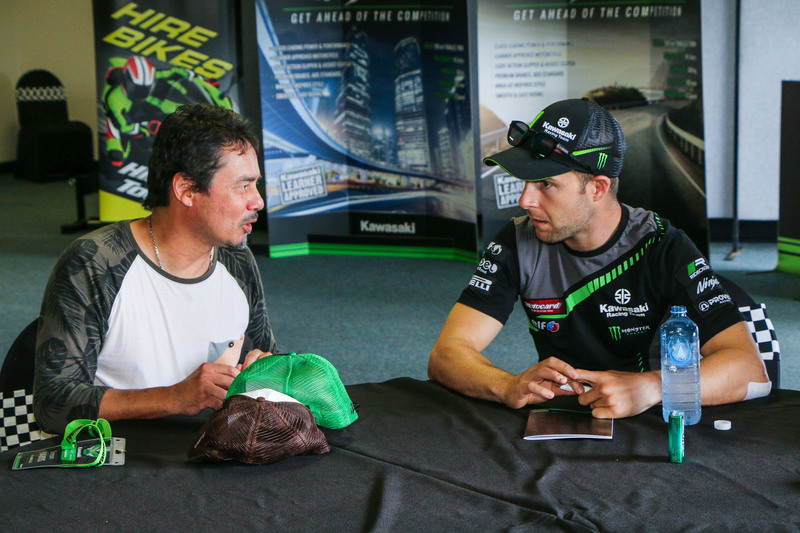 Namely, Jonathan Rea – three times and current World Superbike Champion, and the Ninja 400 project leader Kunihiro Tanaka (also interpreted), factory development and test rider Kenishi Tojo, and KMA managing director Kenishi Hashibsa. I had the privilege to spend a few minutes with them and ask a few questions. 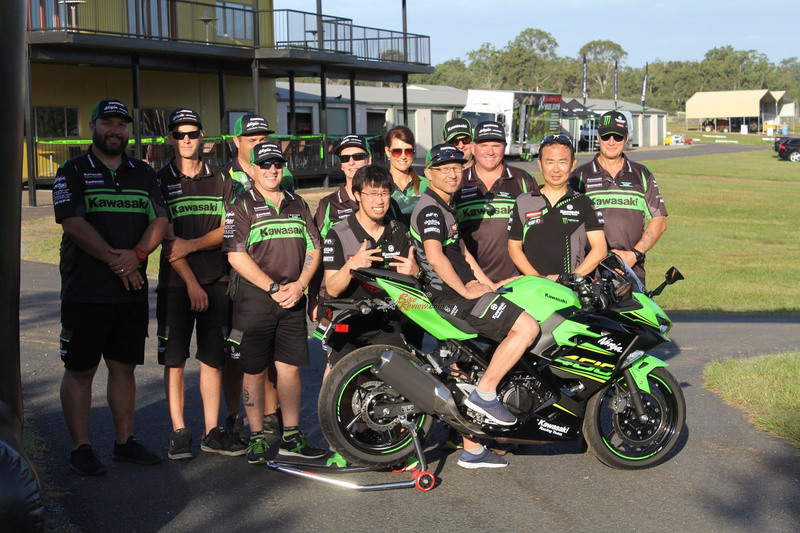 Simon Harris with (Left) Kawasaki Australia MD Kenichi Hashiba, Kawasaki Factory Test Rider Kenichi Tojo (front) and Ninja 400 Project leader Kunihiro Tanaka Right). Simon Harris: Thanks you very much,gentlemen for being here. It was a lovely and very forgiving machine to ride. 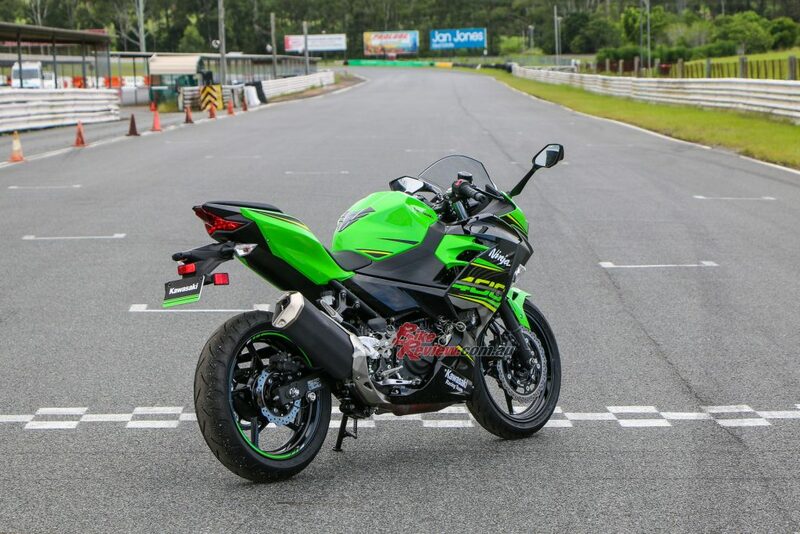 So, very good for newcomer and learning to ride, and beyond learner as its quite fast and handling is very good. Kenichi Tojo: Thanks you for your observations. I believe that Tojo-san and Kuni-san develop it in that way. To try to balance it up for even skilled rider or LAMS rider… they can enjoy their own way. SH: When you first start a project, where do you start? 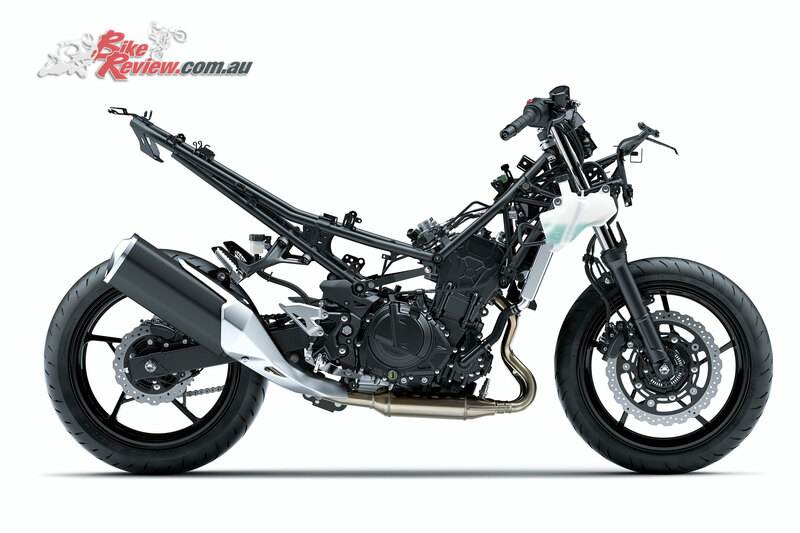 Engine, frame…how do you work out the formula for what you want the bike to achieve? KT: The normal development procedure…it is engine that is the component to start with because it has the longest lead-time. SH: Okay. So, if an engine is putting out 50hp or 200hp, then you design the rest of the bike to suit the kind of power? KT: Yes, that is how it flows. 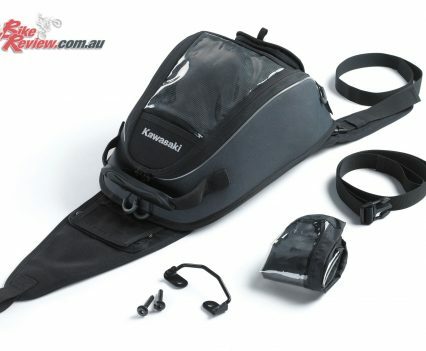 KT: Keni-san’s favourite bike is the Ninja 400. As a in marketing and leading role it is…this project it is like a baby to him [laughing]. “My daughter” laughs Keni-san. KT refers to Tojo-san: He is a professional rider, but it is the first model he developed that most impressed. The VN1600, that’s the one. He was so excited that the night before the very first VN1600 was produced, he coudln’t sleep [laughing]. He was a bit anxious. SH: That is so good…to see so much heart in your products. And I see you all smiling. I’m sure that when you see everyone riding around and smiling that I don’t think anyone can say anything bad about this motorbike…the feeling is so good. SH: So, what is the next project? KT: Future development? Unfortunately, we can’t tell you [laughs]. SH: But still… always new models…development, and refinement? KT: Yes-yes, we have a lot of project across the board. They [the competition] are chasing us. We are confident, that in this class we are a leader. 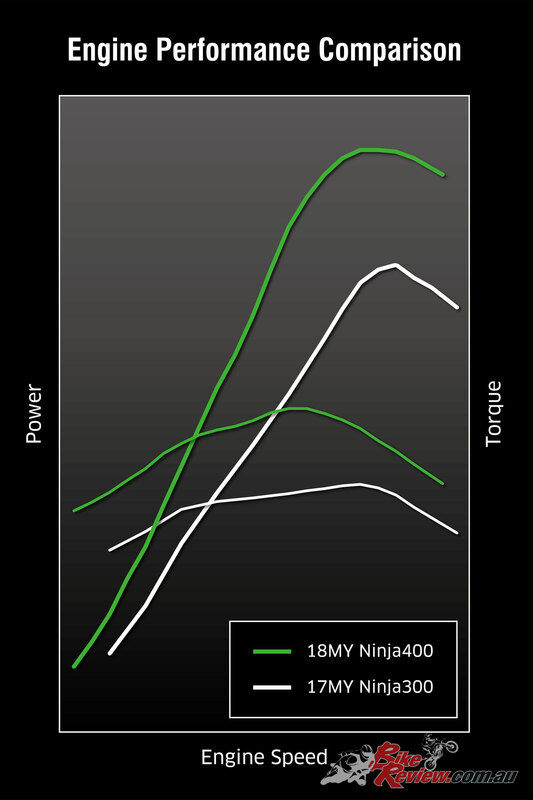 As you know the Ninja 300 was the leader, so for use we think we can keep the lead. SH: Thanks so much for your time and all the best. 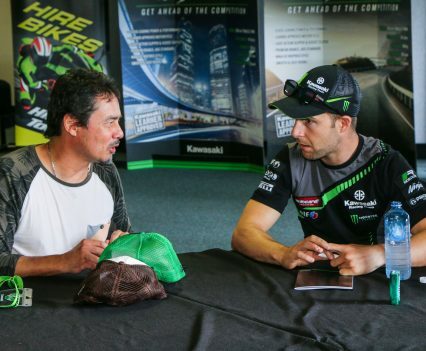 Simon caught up with three times WorldSBK Champion Jonathan Rea MBE and gave him a few drinking tips. 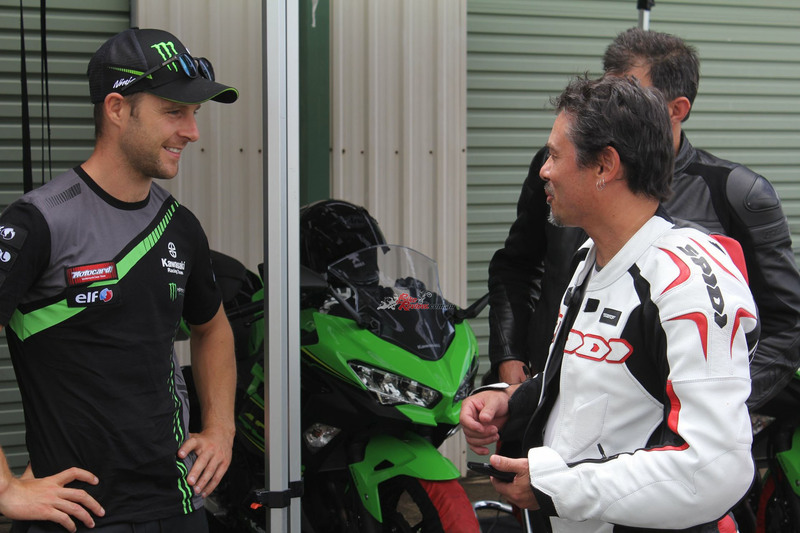 Simon chatting with Jonathan Rea at Lakeside Raceway Ninja 400 Launch. Technical presentation led by KMA’s Robert Walker, Milo Dokmanovic and Gina Costello. 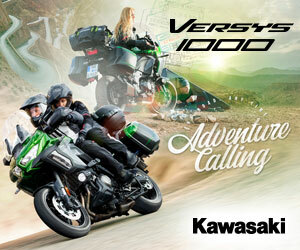 There is a range of accessories available through your local Kawasaki dealership. Wave front roto and ABS as standard. Wide, high ‘bars and open cockpit area. Wave rear rotor, two-piston caliper. 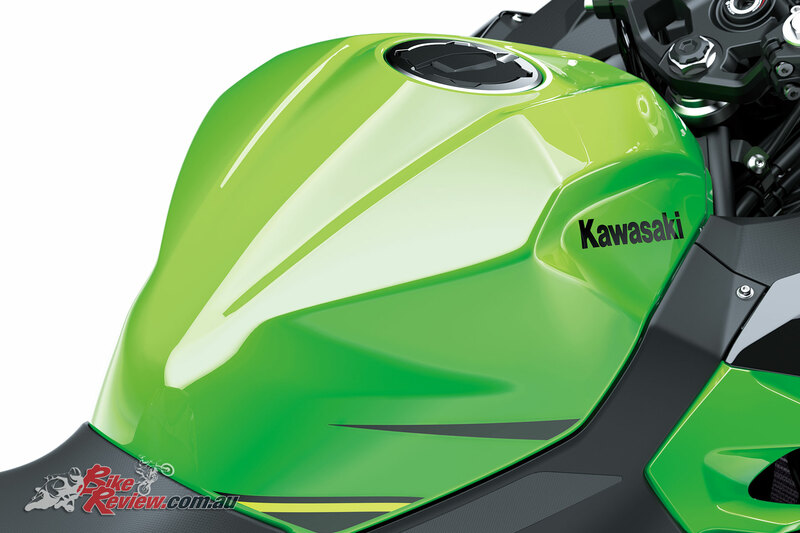 The 2018 Kawasaki Ninja 400 is an all new bike on sale now from $7699 Ride Away. It is lighter and more powerful than the outgoing 300, with distinct H2 styling and comes in three colours here in Australia. Simon tested the bike at Lakeside over 70 laps and rated it a 9/10.